You can get paid to write a book. It's easily possible to make a fast $10,000, or even a six figure amount. You could even make seven figures --- over a million dollars for twenty pages of text. It sounds incredible, but a fast seven figures is certainly possible if you have a HOT, hot idea or have had an experience that hundreds of thousands of people want to read about. In his 2001 book about w… riting non-fiction, Damn! 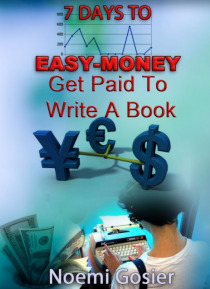 Why Didn't I Write That?, author Marc McCutcheon says that it's not hard to make a good income: "e;you can learn the trade and begin making a respectable income much faster than most people think possible"e;. The good part is that you don't need to write your book before you get some money. You write a proposal, and a publisher will give you an advance, which you can live on while you write the book. Enjoy your ebook: "e;7 Days To Easy Money"e;!